“Writing is what I do no matter what, whether I was broke or not. I would always find a way to express myself,” says Ismail Azeem. Always in search of that “way,” Azeem’s been on a haj, seeking out different poetic locales through the blocks of Oakland and beyond. 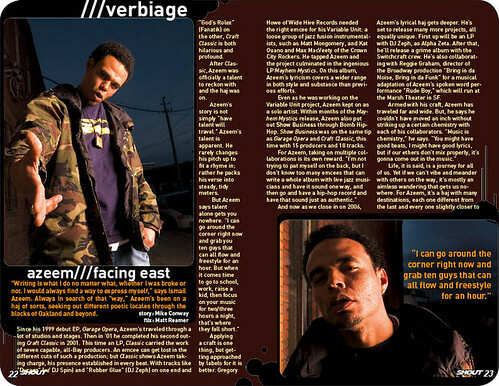 Since his 1999 debut EP, Garage Opera, Azeem’s traveled through a lot of studios and stages. Then in ‘01 he completed his second outing, Craft Classic in 2001. This time an LP, Classic carried the work of seven capable, all-Bay producers. An emcee can get lost in the many different cuts of such a production; but Classic shows Azeem taking charge, his presence established in every beat. With tracks like “Duragz” (w/ DJ Spin) and “Rubber Glue” (DJ Zeph) on one end and “God’s Rolex” (Fanatik) on the other, Craft Classic is both hilarious and profound. Persistence is one thing, but getting approached by labels for it is better. When Gregory Howe of Wide Hive Records needed the right emcee for his Variable Unit--a loose group of jazz fusion instrumentalists, such as Matt Mongomery, and Kat Ouano and Max MacVeety of the Crown City Rockers--he tapped Azeem and the project culminated in the ingenious LP Mayhem Mystics. On this album, Azeem’s lyricism covers a wider range in both style and substance than on previous efforts. Even as he was working on the Variable Unit project, Azeem kept on as a solo artist. Within months of the Mayhem Mystics release, Azeem also put out Show Business through Bomb Hip-Hop. Show Business was on the same tip as Garage Opera and Craft Classic, this time with 15 producers and 18 tracks. And now as we close in on 2006, Azeem’s lyrical haj gets deeper. He’s set to release many more projects, all equally unique. First up will be an LP with DJ Zeph, as Alpha Zeta. After that, he’ll release a grime album with the Switchcraft crew. He’s also collaborating with Reggie Graham, director of the Broadway production “Bring in da Noise, Bring in da Funk” for a musical adaptation of Azeem’s spoken word performance “Rude Boy,” which will run at the Marsh Theater in SF. Throw in some other collaborations with Om Records' artists Colossus and with an mix/mash DJ Child, and you get a good idea about how dedicated this emcees is to his art. Life, it is said, is a journey for all of us. Yet if we can’t vibe and meander with others on the way, it’s mostly an aimless wandering that gets us nowhere. For Azeem, it’s a haj with many destinations, each one different from the last and every one slightly closer to Mecca.